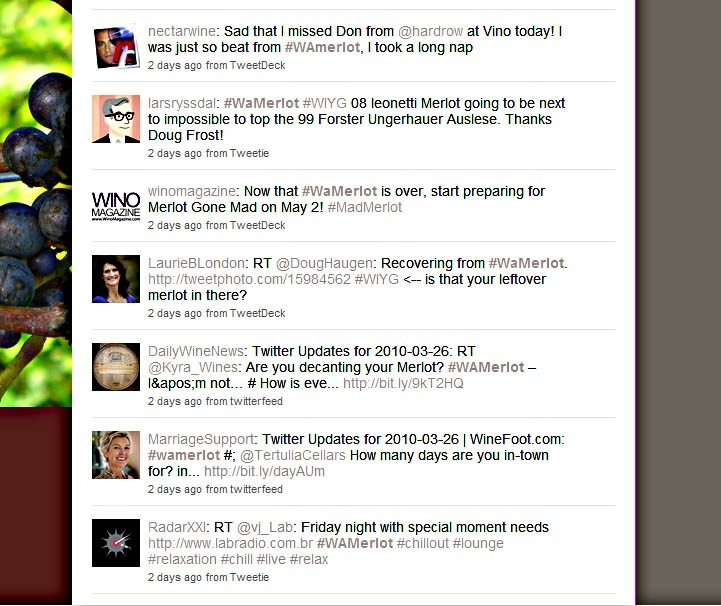 March 25th was the date for #WAMerlot a virtual wine tasting put together by Josh Wade of drinknectar.com. Yes, the virtual part included using social media tools like twitter, Facebook, Blog, video etc. And the tasting part required finding a nice bottle of Washington Merlot…somewhere, somehow. Wine bars, homes, wineries, and festivals were just a few of the many places to host a #WAMerlot event. The “virtual tasting” united the two worlds of social media and a glass of Merlot. Participants tasted, talked, tweeted, blogged, Facebooked and videod the virtues of the wine to the virtual wine universe and other like minded #WAMerlot hashtag followers. Here is a snippet of the day after #WAMerlot conversation on twitter. As you can see participants took the virtual experience quite seriously. My #WAMerlot evening was spent with the folks at Emerald City Trapeze and TwestivalSEA. It doesn’t get much better than Trapeze and a nice Merlot (this is not an endorsment to drink and fly). I also made an attempt to virtually be at Harbor Square Wine Shop with @shannonevans to participate in the first ever wine tweet-up on Bainbridge Island (F.Y. I. even virtually it’s still difficult to be in two places at one time). A big thanks to Harbor Square Wine Shop, Brian Carter Cellars, NW Totem Cellars, William Church Winery, Alexandria Nicole Cellars, Sparkman Cellars, Magnificent Wine Co. TwestivalSEA and Emerald City Trapeze Arts, a fun time was had by all! Awesome wrap-up. Glad that Twestival and WAMerlot could have a fun marriage together! Sounds like a great cause. $10k – WOW! Congrats to you for skillfully coordinating the #WAMerlot event. It is much talked about around here so it’s got a virtual life of it’s own. When is the next event?